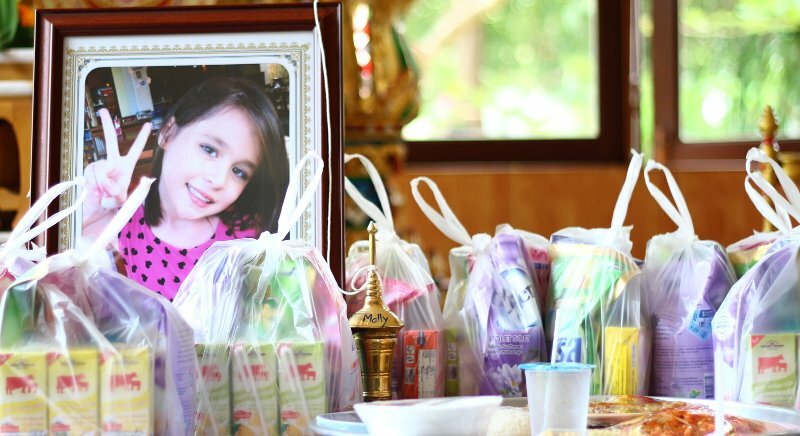 Yesterday waw March 13, which would have been Molly Anne Bailey’s eighth birthday, had she not died on December 11 last year after her mother drove into a huge hole in a Phuket road that had not been marked with effective warnings. The hole was left after heavy rain caused a section of a minor road in Srisoonthorn to collapse, leaving a gaping gap eight metres long and two metres deep, into which the car crashed. The road had been wrecked for a month but the local Srisoonthorn Municipality, pleading poverty, did nothing about repairs and erected temporary barriers which later disappeared and were not replaced. 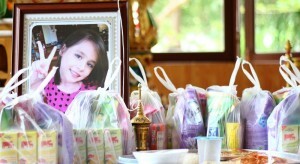 At Wat Thepwanaram in Baan Manik today (March 13), where Molly’s parents went to attend a ceremony to mark the 100th day after Molly’s death, her mother, Phakkamon Duangchaytemcharat, 38, told The Phuket News that the officials who failed to repair the road should apologise. Molly’s father Gordon “Badger” Bailey said, “We’ve been waiting and waiting and waiting and nothing’s been done. But they’ve got plenty of time to be out and spending lots of money [on the annual celebration of the Heroines’ Victory]. The Mayor of Srisoontorn Municipality, Worawut Songyod, was not at the 100-day ceremony. Ms Phakkamon said, “Today, Molly should be enjoying her birthday. We should not be here marking the 100th day after her death. It is sad, so sad, really. It is a day that I must remember.